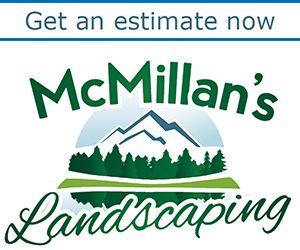 Buffalo-NiagaraGardening.com > Garden tips > Yes, you do have enough room to garden in Buffalo! Yes, you do have enough room to garden in Buffalo! I often hear people say that they don’t have room to garden. They live in an apartment, they explain, and have only a small patio area. Or worse, they’re not even on the ground floor. Those things didn’t bother the folks with these second-floor balconies that I happened to spot in Buffalo this year. 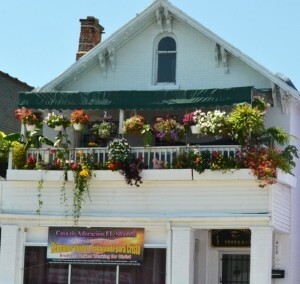 At left, this balcony on Niagara St. near Hudson has more flowers than your average suburban yard! The folks here could have settled for a single hanging basket, but instead hung an entire row of baskets. In addition, flowers are planted in boxes along the railing. They used large, colorful plants for a lush look. Notice also that the plants have different growing habits. Some grow tall and some cascade down, adding more interest. The two sets of plants create a screen that provides a secluded sitting area on a busy street. The flowers can be enjoyed by passersby on the street as well as by the folks relaxing on the balcony. What surprised me about the garden at left on Summer near Norwood was the arbor. 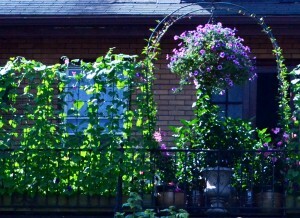 You don’t need a large space to effectively use a garden structure such as a trellis. The structure might have looked like a doorway to nowhere, but the gardeners filled the space with containers on the ground and a hanging basket– a large one– hanging from the top. In addition, flower boxes run along the railing. The folks added a grid-like fence or trellis for vines to grow along. Like the first garden, this gives the residents a private spot on a busy street, while providing a lovely sight for pedestrians to enjoy. Oh, one more thing. Container gardening counts as gardening! Buffalo gardeners are the most creative gardeners around, finding a place to plant in the smallest and most difficult areas, and doing it successfully as well. You’re absolutely right. And you can find so many great ideas by just looking around. 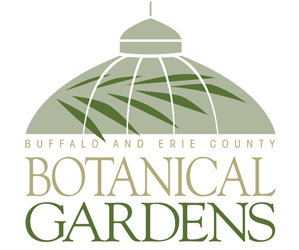 Plus, the Buffalo area has all the garden walks, where people are happy to show you their gardens and share things they’ve learned along the way. I think we all take it for granted– like we take Niagara Falls for granted. But other areas don’t have quite the gardening community we have here in Western New York. the “grid like fence” on Summer st. looks like wire sold for reinforcing cement patios – available at home improvement centers. I love the stuff. Its cheap and rusts to a beautiful color which softens its appearance. I didn’t know that. I’m learning more and more about stuff sold in hardware stores that gardeners can use. Thanks so much for that helpful information!